Mercedes Benz Fashion Week Swim 2012 in Miami Beach is always a fun time to oogle hot boys + girls and drink your way through the weekend. To be honest, before I moved to Miami, I had never heard of the Swim Shows. MB Fashion Weeks in New York / London / Paris / Milan were the only ones I attended, but after a couple of times experiencing Swim Week (boys + girls in nothing but skimpy swimwear), I welcome it with open arms. As you know, Johnny Boy loves a great party, and this invitation not only proves to be loads of fun (read: gift bags from Clarins), but the invitation is super retro and cute. Vogue + Clarins together at The Webster Miami promises to be the Must Go To Event this Swim Week, though it's by invitation only. I'm sure if you go and drop loads of bills there before Friday, July 20th, you can score an invite...They are having a HUGE sale now anyways. The Lazy Sunday BBQ (July 22nd) during Swim Week will be hosting the opening of the Spin Standard Collaboration with a Ping Pong Tournament featuring teams from The Daily, WildFox, Poplife, and shocking...The Webster Miami. My spies have informed me that they are flying in super stars "Kazmanian Devil" and the "Infamous Wally Green" to play alongside guests. 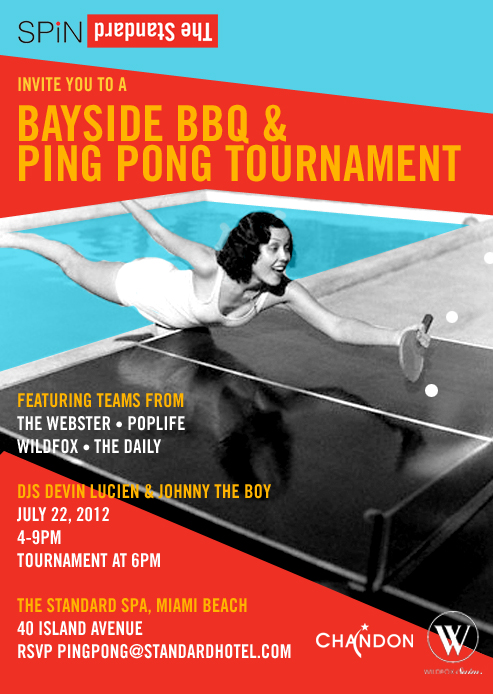 BBQ food, drinks, and ping pong all Bayside is going to be HEAVEN, especially at Sunset!!! Please tell me you have a cute ping pong playing outfit.